Thomas A. Limoncelli is a noted system and network administrator employed at Google. He speaks at conferences worldwide on a variety of topics. Christina J. Hogan has more than ten years' system administration experience. She now works at the BMW Sauber F1 team as an aerodynamicist. Strata R. Chalup is a twenty-year veteran of system administration and technical project management. She is the founder of Virtual.Net, Inc.
Our goal for this book has been to write down everything we've learned from our mentors and to add our real-world experiences. These things are beyond what the manuals and the usual system administration books teach. This book was born from our experiences as SAs in a variety of organizations. We have started new companies. We have helped sites to grow. We have worked at small start-ups and universities, where lack of funding was an issue. We have worked at midsize and large multinationals, where mergers and spin-offs gave rise to strange challenges. We have worked at fast-paced companies that do business on the Internet and where high-availability, high performance, and scaling issues were the norm. We've worked at slow-paced companies at which high tech meant cordless phones. On the surface, these are very different environments with diverse challenges; underneath, they have the same building blocks, and the same fundamental principles apply. This book gives you a framework--a way of thinking about system administration problems--rather than narrow how-to solutions to particular problems. Given a solid framework, you can solve problems every time they appear, regardless of the operating system (OS), brand of computer, or type of environment. This book is unique because it looks at system administration from this holistic point of view; whereas most other books for SAs focus on how to maintain one particular product. With experience, however, all SAs learn that the big-picture problems and solutions are largely independent of the platform. This book will change the way you approach your work as an SA. The principles in this book apply to all environments. The approaches described may need to be scaled up or down, depending on your environment, but the basic principles still apply. Where we felt that it might not be obvious how to implement certain concepts, we have included sections that illustrate how to apply the principles at organizations of various sizes. This book is not about how to configure or debug a particular OS and will not tell you how to recover the shared libraries or DLLs when someone accidentally moves them. Some excellent books cover those topics, and we refer you to many of them throughout. Instead, we discuss the principles, both basic and advanced, of good system administration that we have learned through our own and others' experiences. These principles apply to all OSs. Following them well can make your life a lot easier. If you improve the way you approach problems, the benefit will be multiplied. Get the fundamentals right, and everything else falls into place. If they aren't done well, you will waste time repeatedly fixing the same things, and your customers 1 will be unhappy because they can't work effectively with broken machines. 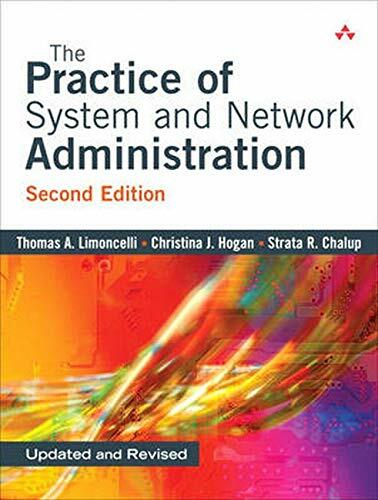 This book is written for system administrators at all levels. It gives junior SAs insight into the bigger picture of how sites work, their roles in the organizations, and how their careers can progress. Intermediate SAs will learn how to approach more complex problems and how to improve their sites and make their jobs easier and their customers happier. Whatever level you are at, this book will help you to understand what is behind your day-to-day work, to learn the things that you can do now to save time in the future, to decide policy, to be architects and designers, to plan far into the future, to negotiate with vendors, and to interface with management. These are the things that concern senior SAs. None of them are listed in an OS's manual. Even senior SAs and systems architects can learn from our experiences and those of our colleagues, just as we have learned from each other in writing this book. We also cover several management topics for SA trying to understand their managers, for SAs who aspire to move into management, and for SAs finding themselves doing more and more management without the benefit of the title. Throughout the book, we use examples to illustrate our points. The examples are mostly from medium or large sites, where scale adds its own problems. Typically, the examples are generic rather than specific to a particular OS; where they are OS-specific, it is usually UNIX or Windows. One of the strongest motivations we had for writing this book is the understanding that the problems SAs face are the same across all OSs. A new OS that is significantly different from what we are used to can seem like a black box, a nuisance, or even a threat. However, despite the unfamiliar interface, as we get used to the new technology, we eventually realize that we face the same set of problems in deploying, scaling, and maintaining the new OS. Recognizing that fact, knowing what problems need solving, and understanding how to approach the solutions by building on experience with other OSs lets us master the new challenges more easily. We want this book to change your life. We want you to become so successful that if you see us on the street, you'll give us a great big hug. If we've learned anything over the years, it is the importance of simplicity, clarity, generality, automation, communication, and doing the basics first. These six principles are recurring themes in this book. Simplicity means that the smallest solution that solves the entire problem is the best solution. It keeps the systems easy to understand and reduces complex component interactions that can cause debugging nightmares. Clarity means that the solution is straightforward. It can be easily explained to someone on the project or even outside the project. Clarity makes it easier to change the system, as well as to maintain and debug it. In the system administration world, it's better to write five lines of understandable code than one line that's incomprehensible to anyone else. Generality means that the solutions aren't inherently limited to a particular case. Solutions can be reused. Using vendor-independent open standard protocols makes systems more flexible and makes it easier to link software packages together for better services. Automation means using software to replace human effort. Automation is critical. Automation improves repeatability and scalability, is key to easing the system administration burden, and eliminates tedious repetitive tasks, giving SAs more time to improve services. Communication between the right people can solve more problems than hardware or software can. You need to communicate well with other SAs and with your customers. It is your responsibility to initiate communication. Communication ensures that everyone is working toward the same goals. Lack of communication leaves people concerned and annoyed. Communication also includes documentation. Documentation makes systems easier to support, maintain, and upgrade. Good communication and proper documentation also make it easier to hand off projects and maintenance when you leave or take on a new role. Basics first means that you build the site on strong foundations by identifying and solving the basic problems before trying to attack more advanced ones. Doing the basics first makes adding advanced features considerably easier and makes services more robust. A good basic infrastructure can be repeatedly leveraged to improve the site with relatively little effort. Sometimes, we see SAs making a huge effort to solve a problem that wouldn't exist or would be a simple enhancement if the site had a basic infrastructure in place. This book will help you identify what the basics are and show you how the other five principles apply. Each chapter looks at the basics of a given area. Get the fundamentals right, and everything else will fall into place. These principles are universal. They apply at all levels of the system. They apply to physical networks and to computer hardware. They apply to all operating systems running at a site, all protocols used, all software, and all services provided. They apply at universities, nonprofit institutions, government sites, businesses, and Internet service sites. If you asked six system administrators to define their jobs, you would get seven different answers. The job is difficult to define because system administrators do so many things. An SA looks after computers, networks, and the people who use them. An SA may look after hardware, operating systems, software, configurations, applications, or security. A system administrator influences how effectively other people can or do use their computers and networks. A system administrator sometimes needs to be a business-process consultant, corporate visionary, janitor, software engineer, electrical engineer, economist, psychiatrist, mindreader, and, occasionally, a bartender. As a result, companies calls SAs different names. Sometimes, they are called network administrators, system architects, system engineers, system programmers, operators and so on. This book is for "all of the above." We have a very general definition of system administrator: one who manages computer and network systems on behalf of another, such as an employer or a client. SAs are the people who make things work and keep it all running. It's difficult to define system administration, but trying to explain it to a nontechnical person is even more difficult, especially if that person is your mom. Moms have the right to know how their offspring are paying their rent. A friend of Christine Hogan's always had trouble explaining to his mother what he did for a living and ended up giving a different answer every time she asked. Therefore, she kept repeating the question every couple of months, waiting for an answer that would be meaningful to her. Then he started working for WebTV. When the product became available, he bought one for his mom. From then on, he told her that he made sure that her WebTV service was working and was as fast as possible. She was very happy that she could now show her friends something and say, "That's what my son does!" The widespread use of the Internet, intranets, and the move to a webcentric world has redefined the way companies depend on computers. The Internet is a 24/7 operation, and sloppy operations can no longer be tolerated. Paper purchase orders can be processed daily, in batches, with no one the wiser. However, there is an expectation that the web-based system that does the process will be available all the time, from anywhere. Nightly maintenance windows have become an unheard-of luxury. That unreliable machine room power system that caused occasional but bearable problems now prevents sales from being recorded. Management now has a more realistic view of computers. Before they had PCs on their desktops, most people's impressions of computers were based on how they were portrayed in film: big, all-knowing, self-sufficient, miracle machines. The more people had direct contact with computers, the more realistic people's expectations became. Now even system administration itself is portrayed in films. The 1993 classic Jurassic Park was the first mainstream movie to portray the key role that system administrators play in large systems. The movie also showed how depending on one person is a disaster waiting to happen. IT is a team sport. If only Dennis Nedry had read this book. In business, nothing is important unless the CEO feels that it is important. The CEO controls funding and sets priorities. CEOs now consider IT to be important. Email was previously for nerds; now CEOs depend on email and notice even brief outages. The massive preparations for Y2K also brought home to CEOs how dependent their organizations have become on computers, how expensive it can be to maintain them, and how quickly a purely technical issue can become a serious threat. Most people do not think that they simply "missed the bullet" during the Y2K change but that problems were avoided thanks to tireless efforts by many people. A CBS Poll shows 63 percent of Americans believe that the time and effort spent fixing potential problems was worth it. A look at the news lineups of all three major network news broadcasts from Monday, January 3, 2000, reflects the same feeling. Previously, people did not grow up with computers and had to cautiously learn about them and their uses. Now more and more people grow up using computers, which means that they have higher expectations of them when they are in positions of power. The CEOs who were impressed by automatic payroll processing are soon to be replaced by people who grew up sending instant messages and want to know why they can't do all their business via text messaging. Computers matter more than ever. If computers are to work and work well, system administration matters. We matter. Part I: Getting Started. This is a long book, so we start with an overview of what to expect (Chapter 1) and some tips to help you find enough time to read the rest of the book (Chapter 2). Part II: Foundation Elements. Chapters 3-14 focus on the foundations of IT infrastructure, the hardware and software that everything else depends on. Part III: Change Processes. Chapters 15-21 look at how to make changes to systems, starting with fixing the smallest bug to massive reorganizations. seven basic services, such as email, printing, storage, and web services. Part V: Management Practices. Chapters 30-36 provide guidance--whether or not you have "manager" in your title. The two appendixes provide an overview of the positive and negative roles that SAs play and a list of acronyms used in the book. Each chapter discusses a separate topic; some topics are technical, and some are nontechnical. If one chapter doesn't apply to you, feel free to skip it. The chapters are linked, so you may find yourself returning to a chapter that you previously thought was boring. We won't be offended. Each chapter has two major sections. The Basics discusses the essentials that you simply have to get right. Skipping any of these items will simply create more work for you in the future. Consider them investments that pay off in efficiency later on. The Icing deals with the cool things that you can do to be spectacular. Don't spend your time with these things until you are done with the basics. We have tried to drive the points home through anecdotes and case studies from personal experience. We hope that this makes the advice here more "real" for you. Never trust salespeople who don't use their own products. We received a lot of feedback from our readers about the first edition. We spoke at conferences and computer user groups around the world. We received a lot of email. We listened. We took a lot of notes. We've smoothed the rough edges and filled some of the major holes. Limoncelli, Thomas A.; Hogan, Christina J.; Chalup, Strata R.